Schools across the country recognize the need to adapt their classrooms to new styles of learning made possible with new technology. Only recently, however, are they seeing the significance of flexible classroom furniture that makes it all work. The move toward active and collaborative learning brings a much-needed change into the traditional learning environment – that is, the flexibility to curate lessons and classroom layout to match the learning needs of the students. However, many schools aren’t sure how to convert from a traditional, lecture-based classroom into a more collaborative and flexible setup that offers distinct learning zones. What is the right layout for your school? 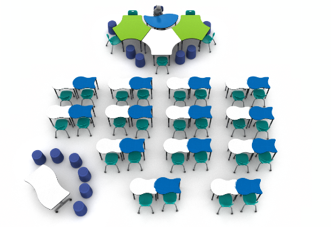 Also, what features should you look for when selecting new flexible classroom furniture? Can the conversion happen in phases and where is the best place to start? Take a look at how some schools are reinventing the tried-and-true lecture-based classroom setup. There is plenty of research that supports project-based learning, collaborative learning, flipped classrooms and active learning strategies, among others. However, sometimes there is still a need for lecture-based instruction. Traditionally, lecture-based learning is a presentation method where the focus is on the material, and the delivery is by the instructor. In a nutshell, teachers teach the lesson and students listen. Benefits auditory learners or learners who have reading disabilities. Offers a quick/straightforward way to provide information to students. Gives instructors greater control over what is being taught in the classroom because they are the sole source of information. Focuses students toward listening, communicating and providing feedback in an orderly manner. 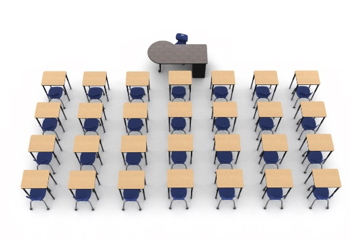 Since this method of instruction dominated learning environments for the last century, classroom furniture adapted to fit this rigid, lecture-based model. However, today’s teachers have gotten creative with their delivery methods and are infusing technology and other resources to make these lectures FUN! This has created a demand for more flexible classroom furniture that can accommodate new styles of teaching and collaborative learning. Traditional classroom layouts are very linear, and inflexible by nature. The teacher sits at the front of the classroom while the students are lined up individually in rows. In the “old days,” this structured approach also meant students were scolded when they got out of their chairs without permission and weren’t allowed to ask questions out of turn. They were not encouraged to solve problems with other students, and much of the work was done independently. Thus, the classroom layout was made to adhere to this teaching style. The furniture was not flexible and made it hard to create a collaborative environment once the lecture was finished. So, how are things changing? Students are learning differently, and teachers are adapting the way they present material. Flexible classrooms give teachers more options to build a learning environment that adapts to different styles of teaching. Collaborative, mobile, and flexible classroom furniture comes in shapes and sizes that allow for easy setups that let the teachers engage with students in the best possible way. For example, a teacher might need to start the day with a lecture setup in the morning, but switch to a collaborative layout for the afternoon as the students work through practical exercises. Use of animated video libraries such as TedEd to spark ideas and share learning from around the world. Introducing global online classrooms such as the Khan Academy that support flipped learning techniques. Incorporating interactive games to engage students in a new, fun way. We live, teach and learn in a world that is continually redefining traditional spaces. A one size fits all approach to classroom setup and furniture might have worked well fifty years ago, but today’s students and teachers have more resources available than ever before. 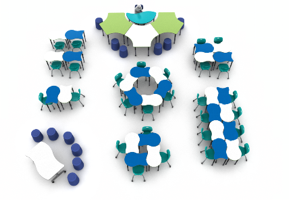 Schools are discovering the value of collaborative, active learning setups made possible with flexible classroom furniture. There will always be a place for lecture-based learning in the classroom, but that shouldn’t be the only learning style our classroom furniture supports. What's Next? For classroom layout ideas that support lecture-based learning, download Artcobell’s Collaborative Conversion Workbook.